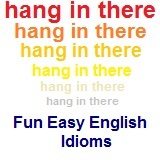 ﻿ Fun Easy English - new classroom free online classes english language lessons speaking listening writing reading october 29. Today in the classroom you are going to learn some idioms beginning with the letter R.
Today learn idioms beginning with the letter R.
This idiom has been used for many years. This is used to describe a torrential rain.